Tom Murphy of Basswishes displays his wares at the St. Robert Outdoor Sportsman's Show. SAINT ROBERT, Mo. (March 13, 2010) — Like the outdoors? Want to go to a hunting, fishing, camping, and other retail show? If so, the inaugural St. Robert Outdoor Sportsman’s show is still open until 6 p.m. at the St. Robert Community Center on Old Route 66. Event coordinator Ashley Sielke said attendance so far has been more than 400 people — far more than she expected for a first-year event. Sielke said when the doors opened at 10 a.m., there were already people waiting and ready to enter. Within half an hour, the show was filled with people. St. Robert Alderman Gene Newkirk said he’s happy to see so many people in the show. 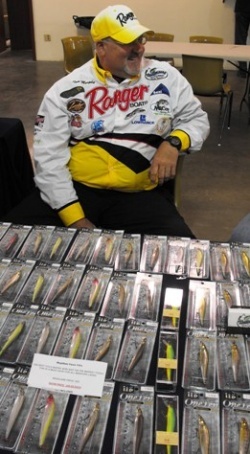 Among the vendors present was Tom Murphy, a Richland alderman and owner of Basswishes, a high-end fishing supply dealer who sells the types of tackle used for professional fishing tournaments. Newkirk and some other St. Robert city officials said that based on the reception this year for the event, they expect they’ll try to extend it next year to two days. This year, there’s no charge to participate in the event, either as a vendor or as a visitor. Pulaski County Tourism Bureau staff member Karen Hood said she’s glad to be able to participate and educate local residents on what Pulaski County offers.